Cheshunt Marsh Footbridge No 44 is a minor waterways place minor waterways place place on the waterways major waterways place village town city on the Lee and Stort Navigation (River Lee) between Waltham Town Road Bridge No 42 (Road Bridge to Waltham Cross (West) and Waltham Abbey (East)) (2¾ furlongs and 1 lock to the southeast) and Rye House Junction (Junction of Rivers Stort and Lee) (6 miles and 3½ furlongs and 6 locks to the north). The nearest place in the direction of Waltham Town Road Bridge No 42 is Waltham Town Lock No 11; 2¼ furlongs away. 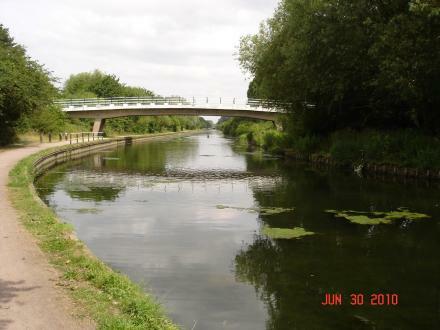 The nearest place in the direction of Rye House Junction is Junction with Powdermill Cut; 4½ furlongs away. High st, Waltham Cross, EN87AA — 1578 yards to the southwest. 6 Foxes Parade, Waltham Abbey, EN9 1PH — 1415 yards to the east. London, EN9 1 — 476 yards to the east. Waltham Cross Community Hub, 60-61 Bartholomew Court, London, EN8 7JU — 1439 yards to the southwest. Christchurch, Dorset, BH23 — 1356 yards to the north. Stanhope Rd, London, EN8 7 — 1170 yards to the west. London — 979 yards to the east. 193 Russell's Ride, Cheshunt, EN88UN — 1522 yards to the northwest. Waltham Abbey Church, Highbridge Street, Waltham Abbey, EN9 1XQ — 994 yards to the east. Station Road, Waltham Cross, EN9 1AB — 167 yards to the south. M25 Business Center, Waltham Abbey, EN9 1JH — 1462 yards to the southeast. Waltham Cross — 1480 yards to the southwest. Station Approach, London, EN8 7 — 990 yards to the southwest. London, EN8 9 — 1617 yards to the north. 108 High Street, Waltham Cross, EN8 7BX — 1377 yards to the southwest. Waltham Cross — 1320 yards to the west. Waltham Abbey — 1415 yards to the east. London — 1492 yards to the south. Youth 2000, 154-155 Brooker Road, Waltham Abbey, Waltham Abbey, EN9 1JH — 1406 yards to the southeast. Abbey Road, Waltham Cross, EN8 7LJ — 1261 yards to the southwest. Brooker Rd, London, EN9 1 — 1196 yards to the southeast. London — 854 yards to the northwest. Waltham Abbey — 1473 yards to the southeast. waltham cross Eleanor road, Hertford, 7 — 1124 yards to the west. Waltham Abbey — 1289 yards to the southwest. 54 Sun Street, Waltham Abbey, EN9 1EJ — 1336 yards to the east. Waltham Abbey, EN9 1XQ — 1109 yards to the east. Waltham Abbey — 1310 yards to the southeast. 17 High Street, Waltham Cross, EN8 7AA — 1570 yards to the southwest. Violet Flame Therapies 18a sun street Waltham abbey, Waltham Abbey, EN91EE — 1201 yards to the east. Skillet Hill Farm, Waltham Abbey, EN9 3QU — 1289 yards to the southwest. London, EN8 7 — 1313 yards to the west. Town Mead Brooker Road, Waltham Abbey, EN9 1JH — 1423 yards to the southeast. Beaulieu Drive, Waltham Abbey, EN9 1JY — 546 yards to the east. 121 Brooker Road, Waltham Abbey, EN91 — 1385 yards to the southeast. Pixel Building 110 Brooker Rd, London, EN9 1 — 1423 yards to the southeast. 1416 yards to the east. 1308 yards to the east.